Just because something is small doesn't mean it's insignificant. 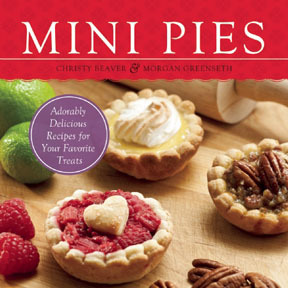 The first thing I noticed when I saw Mini Pies by Christy Beaver and Morgan Greenseth was its size. It is a small paperback cookbook, roughly six inches square. But, as I read through the cookbook, I discovered that it isn't small. 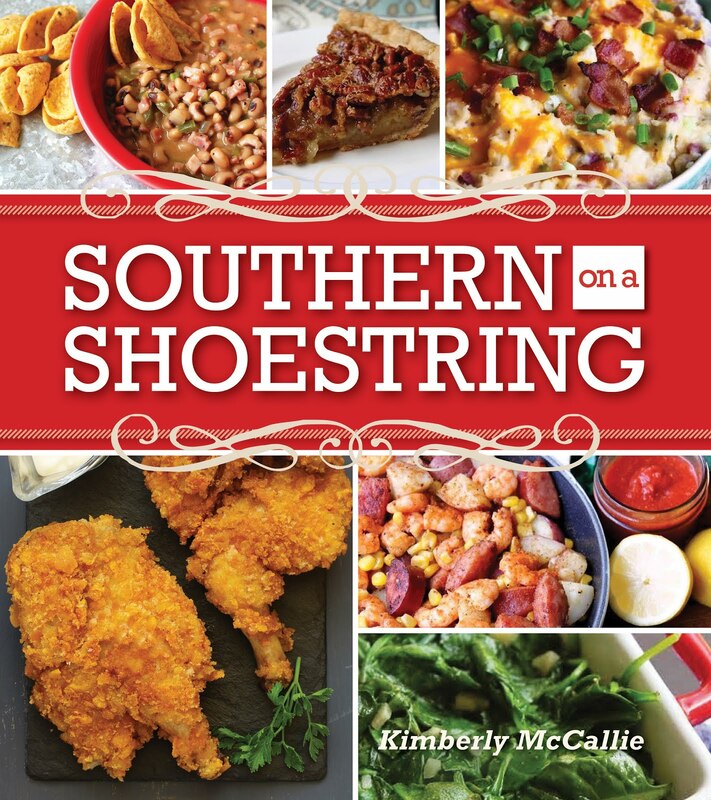 It's just compact, concise, and loaded with rich recipes. And, as you will see, even though the book is small, my results were big! The cookbook is divided into the following categories: Pie Crusts, Fruit Pies, Creamy Custard Pies, Nut and Savory Pies, and Toppings. The pie crust section has pie crusts to suit everyone's tastes from the classics, "perfect pie crust" and graham cracker pie crusts to those with specialized dietary requirements - vegan and gluten-free crusts. All of the classic fruit pies are covered. I'm particulary drawn to the Apple Chai and Ginger Peach. They're next on my to-do list. From the Creamy Custard Pie section, I've decided to make the pumpkin pies for Thanksgiving and will include the gingerbread man-shaped topper. But, the Peanut Butter Cream and Susanne's Lemon Meringue are equally appealing. 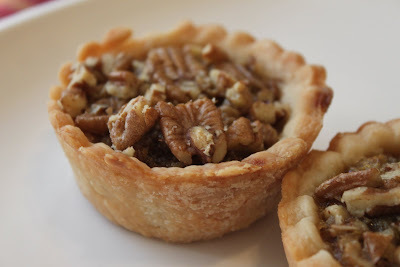 The Nuts and Savory Pies section has what I consider to be the more gourmet recipes: Caramelized Onion, Olive and Thyme Tart, Honey and Pine Nut Tart, and Cranberry Almond Pistachio. But, with Thanksgiving on the horizon, I decided to try out a classic: Bourbon Pecan. Let me go ahead and introduce myself to you as a pie crust-making novice. I've made pies in the past but always with a frozen pie shell. Heck, I couldn't even get the refrigerated pie crust to work for me when I attempted to make a tart. How could I possibly think that I could make a pie crust from scratch? Chop the butter and shortening into 1/4-inch pieces. Place in the freezer to chill while you prepare the other ingredients. Blend the flour, salt, and sugar in a food processor. Add the chilled shortening and process until the mixture climbs the walls of the processor bowl. Add the butter, one piece at a time, and process thoroughly. Add the ice water 1 tbsp. at a time until the mixture comes together in a ball and makes two laps around the processor bowl. Remove the dough, divide it in half, and flatten each half into a disc. 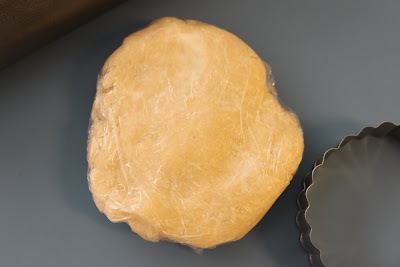 Wrap each disc in plastic wrap and chill in the refrigerator for 30 minutes. But, by closely following the precisely-written directions, I made this pie dough! Isn't it lovely? And, I'm proud and exhausted to say that I made this crust by hand with only the assistance of a pastry cutter. I have, since then, learned how to use my new food processor and will rely on that appliance in the future. Preheat the oven to 350 degrees. Generously grease a 12-cup muffin tin with cooking spray. 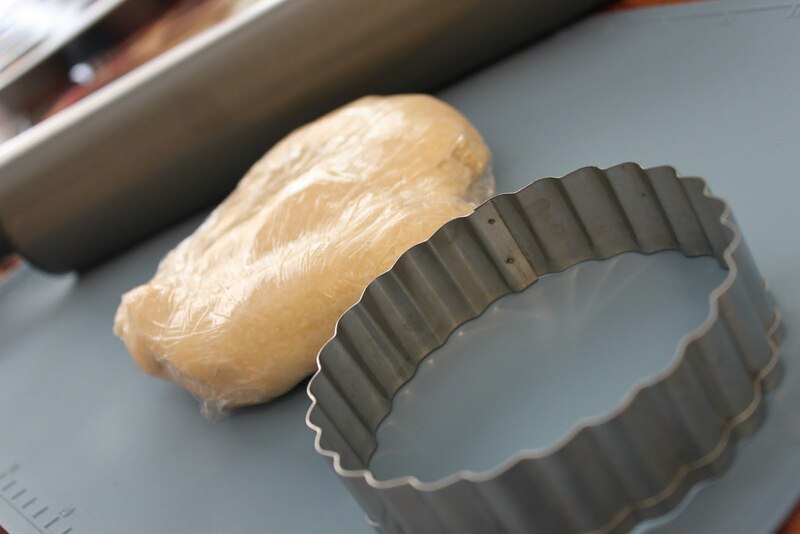 On a thoroughly floured surface, roll out the crust to a thickness of 3/16 inch. Using a 4-inch diameter round cutter, cut 12 crusts. Re-form and re-roll the dough as necessary, keeping plenty of flour on your work surface. For this pie, you want the crusts to be slighly larger than normal. 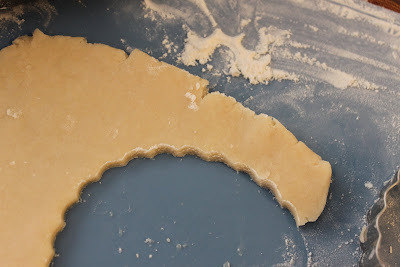 Cut them out as usual, then (working on the floured surface) tap around the edges of each crust with the heel of your hand to stretch it slightly. Using a mini cooking cutter (your choice) and leftover dough, cut out 12 shapes to use as pie toppers. Carefully shape the crusts into the wells of the muffin tin, crimping the edges with your fingers and folding them out over the top of the pan. This will help prevent the crusts from shrinking while they bake. Bake the crusts for 12 minutes, until lightly browned. In a bowl, whisk together the egg, light corn syrup, dark corn syrup, sugar, butter, bourbon, and salt until well combined. Fill the mini crust with 1/2 tbsp. of the egg mixture. Add chopped pecans, using smaller pieces on the bottom and larger pieces on the top. Carefully add another 1/2 to 1 tbsp. egg mixture to each mini pie, coating the pecans. Fill to just below the brim. 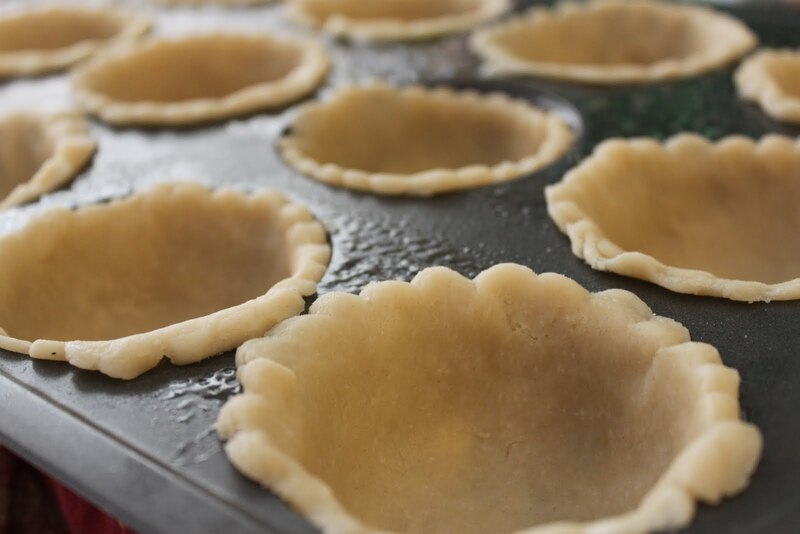 Top each mini pie with a pie topper. Bake for 15 minutes, until the crusts are golden brown. Allow to cool in the muffin tin for a few minutes, then carefully remove the pies from the pan and place on a wire rack to finish cooling. To remove, first try to spin the pies in the muffin wells. If they need a little extra help, run a butter knife along the edge of the crusts to pop them out of the tin. Serve, or store in an airtight container for up to 2 days. This was quite unchartered territory for me. I was amazed that I was able to accomplish it. I know that for some of you making pie crust is a simple process. But, making this one pie crust has opened up a world of possibilities for me. You know how we Southerners like our pecan pie. One note: I didn't have any bourbon but I had some strong bourbon vanilla extract so I used that instead. A big accomplishment thanks to Mini Pies. Christy Beaver and Morgan Greenseth are the co-founders of Mini Empire Bakery in Seattle, Washington. Visit their web site at http://www.miniempirebakery.com/. You did a GREAT, FANTASTIC job! And it was pretty easy for you right? I love this cookbook too and bake from it on my Breville Pie Maker...which I highly recommend! Your Pies look scrumptious. Your little pecan pies look wonderful! These were a great success, thanks for sharing the book! Looks like a great book and recipe! 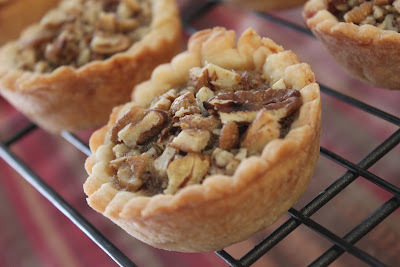 And your Bourbon Pecan mini pies look fab!